Thomas Dixon's book aims to provide supplement material to historical development of views of passions and emotions. Hoping that his historical account will stimulate philosophical and psychological reflection, Dixon's main thesis is that the conception of emotions as a set of morally disengaged, bodily, non-cognitive and involuntary feelings is not due to the rationalist influence but is, in fact, a recent invention of the process of secularization of psychology. Dixon begins by setting the puzzling historical question: when and how did English-language psychological writers stop using "passions," "affections" and "sentiments" as their primary categories and start referring instead to the "emotions"? The story Dixon tells us proceeds both chronologically and thematically. Chapter Two examines the models of the human soul of patristic and scholastic Christian Theologies, especially St. Augustine of Hippo and St Thomas Aquinas. Though, as Dixon refers, it is impossible to pin down exactly what is "Christian psychology," it is possible to identify four main topics that concerned the analysis of emotional life. Dixon claims that at the heart of Christian affective psychology was the conviction that though some human feeling is necessary to life, God, angels and perfected humans are free from perturbations of sin and the passions. Therefore, though it would be fair to find in the Christian tradition a strong distinction between the spiritual and the bodily, it would be wrong to ascribe a reason-emotion dichotomy since the rational mind had its own "emotions." Consequently, the reason-passion dichotomy of the Christian tradition was not a reason-emotion dichotomy. Chapter Three examines some of the movements away from classical Christian psychology towards more secular and mechanistic views of passions and affections in the eighteenth century, as well as ways that the traditional Christian picture was maintained and developed. Exposing the work of Jonathan Edwards, Isaac Watts, Francis Hutcheson, Joseph Butler and Thomas Reid, From Passions to Emotions shows that in a fundamental sense the eighteenth-century discourse of the passions was political. As Dixon explains the concept of human nature was central to the discussions of passions and affections. The disappearance of the will as the locus of human agency meant a new tripartite psychology, which led to a view of emotions that was in contrast with reason, and also distanced from the will. Consequently, Dixon argues, it distanced emotions from individual desires, goals, agency and moral responsibility. Having been mostly concerned with theologians, preachers and religious thinkers, Dixon turns now to examine a more secular tradition. Focusing on works produced during the eighteenth and early nineteenth centuries, especially by certain Scottish empiricist philosophers and their followers, Chapter Four points out the initial baptism of the term emotions. Thomas Brown's Lectures on the Philosophy of the Human Mind adopted the term "emotions" to describe all those feelings that were neither sensations nor intellectual states, suggesting that these mental states were passive and non-cognitive. Thomas Brown accepted the Humean psychology where will and reason vanish to be replaced by a multiple of passions, sentiments, affections, desires or emotions. In Chapter Five and Six, Dixon looks at the appropriation of the Brownian category of emotions by physiological and evolutionary psychologists, in the face of Christian or theistic resistance. Chapter Five examines how the works by Herbert Spencer, Alexander Bain and Charles Darwin defined emotions as instances of the brain and nerves acting upon other parts of the body and denied the mind or soul an active role. Chapter Six, on the other hand, considers various anti-physicalist writers such as Willian Sewell, J.D. Morell, Thomas Upham, William Lyall, George Ramsay, Martyn Paine and James McCosh identifying the problems Christian believers faced in coming to terms with the new Physicalist concept of "emotions." At this point of the book, it becomes clear that there was a crisis of definition that plagued the category of "emotions" and Chapter Seven examines William James attempt to solve this problem and provides a brief summary of the arguments against James. James inverted the traditional assumption that the outward bodily manifestations of emotions were caused either by the activity of the soul or even by the activity of the brain, and argued that the disturbance of the viscera caused the condition of the brain. Finally, Dixon concludes that this story shows that our modern-day category of emotions is rather a blunt instrument when it comes to the construction of ideas about feelings, passions, affections and sentiments and its employment has led to several misconceptions and confusions. Agreeing with Paul Griffiths' claim that "emotion" is a pernicious over inclusive category, Dixon suggests that we need more than one theory, and more than one category to do justice to the phenomena we are seeking to include in the category "emotions" and that the investigation of past affective psychologies reveals alternative, more differentiated systems. 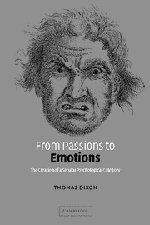 From Passions to Emotions concludes with the suggestion that perhaps a return to a more differentiated typology would help to think more clearly about emotional life. Unfortunately, Dixon never fully explains how we may do this without reviving the entire theological framework. From Passions to Emotions investigates the creation of "the emotions" as a psychological category revealing that the change of vocabulary is not a simple affair for whenever there is such a shift of language many conceptual frameworks are redefined and transformed and some issues are left unattended. It also gives us a sense of the freedom granted by time for Dixon's book can only be written because time distances us from the birth of emotion as a psychological category. It is perhaps because nowadays we are comfortable with dropping the usage of the word "sin" that we can now look back and consider that many things are missing from previous reflection upon emotions. Thomas Dixon is an important historical reference for the continual attempt to provide a clearer picture emotional life. Dina Mendonça is a Postdoctoral Fellow of Fundação para a Ciência e a Tecnologia, Portugal, at the Instituto de Filosofia da Linguagem in the Universidade Nova de Lisboa. Working in a research program on "Pragmatic Analysis of Emotion." This research, of Deweyan inspiration, aims at elaborating a critical interpretation of the philosophy of emotions clarifying: on the one hand, (1) the different methodological approaches to emotions; on the other hand, (2) the topics that surround reflection upon emotion. Among other things, the project aims at the production of a commented bibliography and a research database on philosophy of emotion.